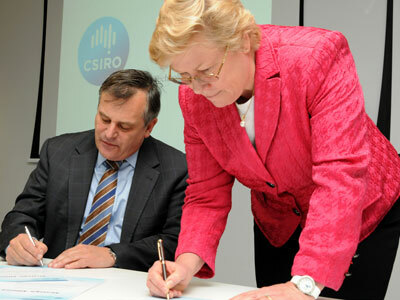 Chief Defence Scientist Dr Alex Zelinksy and CSIRO Chief Executive Dr Megan Clark signing a Strategic Relationship Agreement between DST and CSIRO. DST Groups works to enhance science and technology outcomes by collaborating with other government agencies. This interaction between DST and other organisations not only ensures optimal use of Australia’s public research and development (R&D) resources, but also helps to broaden Australia’s science and technology (S&T) capabilities for both defence and civilian purposes. For more information about collaborating with DST, please contact our Technology Partnerships Office. DST Group has a research agreement with the Australian Nuclear Science and Technology Organisation to collaborate on a number of projects. DST Group and the Bureau of Meteorology have a strategic alliance to explore mutual interests in defence and meteorological sciences. DST Group and CSIRO have a Strategic Relationship Agreement with the purpose of advancing high-impact research priorities for Defence and civilian life in Australia. The Medical Countermeasures Consortium is a four-nation partnership involving the Defence and Health Departments of Australia, Canada, the United Kingdom and the United States.